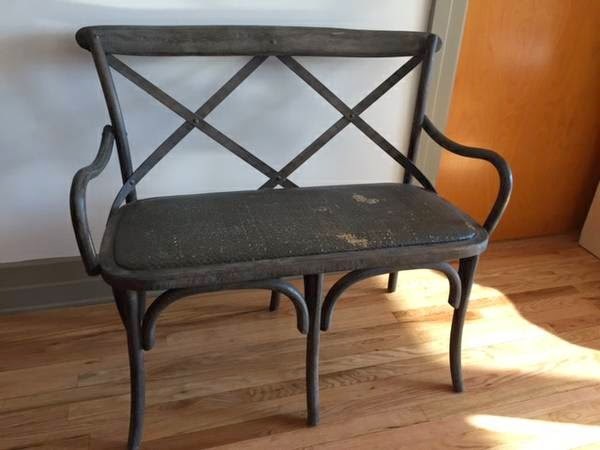 I'd totally shell out the $50 for this two seater bench via craigslist. Alas, no room at the inn. Hope it finds a good home. Anyone else a Craigslist furniture lurker? I have a serious addiction. I can't even explain what I enjoy about it b/c I'm generally not in the market to buy anything. So I'm undecided - is it an unhealthy consumer culture driven addiction or a harmless relaxing waste of time? That's a sweet bench! I have a great spot for that on my porch. Too bad I'm all the way over here in Chicago! Love to browse the furniture sales on Craigslist even if I don't need anything. I imagine what I would do with the items I find if I did have a place for them. Refinish? paint? re-cover? Where would I put it if I had another place to furnish? It's fun to dream a little and yes, probably a relaxing time-waster! But we all need a little of that, right? I am an all-over-the-place lurker! From Facebook to Kijiji...I love a good find! I wish I had a bigger house, just so I could decorate more. Love the bench, that would look great with some funky fabric on the seat, leaving the rustic finish. Great bench. I do the exact same thing, constantly seeing what's on Atlanta craigslist. It's fun to see what's out there and what people are selling their wares for. So right there with you all. I went to pick up a hutch off Craigslist and left with my car full of little tables, garden gnomes, wooden stools, toolboxes etc. I'm a total junkie! I love lurking on craigslist and/or second hand shops. But there is a danger with craigslist and a potential hoarder problem scouting around town for crap. So I am trying to do it only with 1 piece of mind, and only if I need something. PS: I once had a very SCARY Craigslist experience. Be careful people!!! You can't just leave us hanging! What happened? I'm picking up a wood bench here in Kentucky today. It will replace the bench we are now using at our kitchen table. However, for me it's one thing in and one thing out. So, the old bench will be going. This townhouse living requires that, doesn't it? Oh gosh! I knew I liked this bench! How funny. I have seen this post three or so times and kept liking this bench. I have this bench in my office and I didn't realize it was the same. Old age.